IDEAS CITY explores the future of cities around the globe with the belief that art and culture are essential to the vitality of urban centers. Founded by the New Museum in 2011, it is a major collaborative initiative between hundreds of arts, education, and community organizations. The biennial IDEAS CITY Festival takes place every other May in New York City, while IDEAS CITY Global Conferences are organized in key cities around the world. 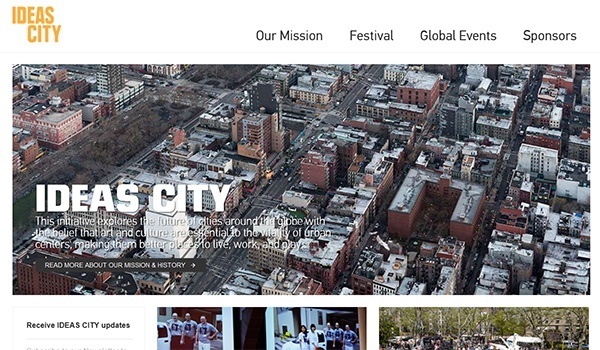 This May, the New Museum will present the third IDEAS CITY Festival in downtown New York that will include a conference, workshops, activities on the street around the Bowery, and dozens of independent projects and public events that function as forums for exchanging ideas, proposing solutions, and accelerating creativity. The theme for the next IDEAS CITY: NY is The Invisible City, and the full program will be announced in early 2015. Within the city, an increasing number of people—such as the homeless, elderly, and undocumented immigrants—are disappearing from sight. Is there a cartography to identify those who have wandered or been driven from the center? The designers shaping the cities of the future must engage with an increasingly challenging set of hypothetical conditions—scenarios that often remain invisible to their inhabitants. How do urbanists, architects, and activists create habitats that anticipate drastic future change such as overcrowding and climate reversals? We are increasingly dependent on global-network infrastructures that are as invisible as they are vast. How can networks and processes be made more transparent, accessible, and empowering? What role do they play in guaranteeing accountability? Can art be the connective membrane in this process? A vast proportion of our lives exist as an invisible online record of our identities, interests, and affiliations. What role does data and privacy play in the perpetuation of democracy in the twenty-first century? Lawrence Lessig, Director of the Edmond J. Safra Center for Ethics, Harvard University, advocates for the open-spectrum movement and the need for a Second Constitutional Congress. Bjarke Ingels, an architect renowned for his innovative approach to sustainable development and renewable energy, is conceptualizing a park to protect New York City from rising water surges and is designing Google’s new campus in Palo Alto, California. Trevor Paglen created the term “Experimental Geography” and uses his work as an artist to shed light on the erosion of privacy. Micah White, Cocreator of Occupy Wall Street and Founder of the Boutique Activist Consultancy specializing in “impossible campaigns” and the handshake between capitalism and activism. Jillian York, Director for International Freedom of Expression at the Electronic Frontier Foundation, specializes in free expression in the Arab world. Christopher Soghoian, principal technologist at the American Civil Liberties Union, is an expert in the role played by third-party service providers in easing law enforcement surveillance of their customers. The next best design idea at Pitching the City, organized by Architizer and Municipal Art Society, will showcase the newest city-building projects. Voting is open to the public. Artist Jordi Jorba will repurpose an inoperative hot-air balloon inside a gymnasium to create colorful, temporary structures that house performances. BattleFest, curated by Kareem Baptiste, bridges the underground and commercial mainstream dance worlds for one-on-one dance battles. For the 2015 Poetic Address to the Nation, Bob Holman, founder of the Bowery Poetry Club, has organized ten poets to contribute sonnets on the state of our union. 2013 IDEAS CITY: São Paulo participant Daniel Lima will present an audiovisual experience with a live score by Brazilian and Harlem-based musicians, infused with interviews by displaced residents of Harlem, São Paulo, Rio, Havana, and Berlin. Danny Hoch will perform an excerpt from Taking Over, a play about gentrification and feelings of displacement in New York City, taking on the character of a taxi dispatcher. Penny Arcade will perform Longing Lasts Longer, a passionate rumination on love, longing, and the loss of New York’s cultural identity, set to a rollicking live-mixed soundscape. Ursula Scherrer will present afloat, v. 2, a durational installation animated by a multiple-projection video environment and a live soundtrack. Using US waste products as construction material, the ETH Zurich Pavilion at the First Street Garden will redefine waste, acknowledging its capacity as a substance from which to construct new cities. In collaboration with New York City Parks and Recreation and First Street Green. The Center for Genomic Gastronomy with Edible Geography uses egg foams to harvest air pollution and make smog meringues from different locations to allow urban atmospheres to be tasted and compared. Presented by the Finnish Cultural Institute. Join artist Marjetica Potrč’s The Invisible Lunch Discussions with incognito speakers to address affordable housing and food at a one hundred-foot-long table stretching the length of Rivington Street. The Hester Street Fair will bring together favorite local fare for a mini food festival on Rivington Street. Genspace, a citizen science biotech lab, and scientist Christine Marizzi from the DNA Learning Center will offer a hands-on bacteria-printing workshop, making New York City’s microbiome visible and accessible. The Institute For Aesthletics’s Mayan Ball Game Tournament will mash the ancient Mesoamerican sport with New York City street basketball. NEW INC, the New Museum’s incubator for art, design, and technology, and cyberfeminist research collective Deep Lab’s week-long residency will explore privacy, security, surveillance, anonymity, and data aggregation, culminating in performances and workshops. Explore the Institute for Public Architecture’s proposals for public and below-market housing in New York City, created in response to Mayor de Blasio’s “total reset” for housing. The Living Theatre presents No Place to Hide, an experimental and participatory theater experience about hiding and the human condition. Cooper Square Committee will lead a Tenants’ Rights Walking Tour, designed to both highlight tenant-organizing victories and the present-day struggles tenants face on the Lower East Side. The Circus for Construction and Austin + Mergold investigates building insulation—a ubiquitous, but invisible, construction material—in an exhibition presented on this traveling event space on the back of a truck. Join the Manny Cantor Center for a senior citizen–led walking tour of the Lower East Side suffused with personal stories of our ever-changing neighborhood. A Pigeon’s Perspective, organized by the Muséum National d’Histoire Naturelle de Paris, is a walking tour that will explain the presence of pigeons on the Lower East Side scientifically, historically, and culturally. The Greenpoint Bioremediation Project with the Urban Soils Institute at Brooklyn College will perform free personal onsite soil testing. A full schedule of events and ticketing information will be announced in the coming weeks.